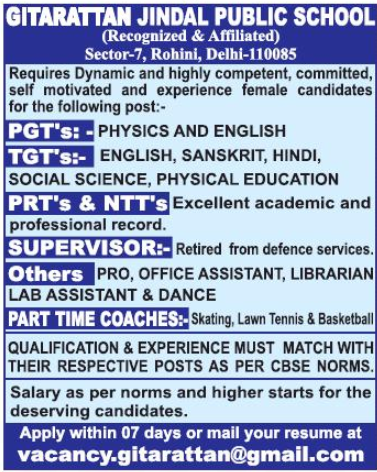 Gitarattan Jindal Public School, New Delhi has advertised in THE HINDUSTAN TIMES newspaper for the recruitment of PGT plus TGT plus PRT jobs vacancies. Interested and eligible job aspirants are requested to apply with in 7 days. Check out further more details below. About School: Rohini Educational Society was set up in the year 1988 by Shri Rattan Lal Jindal as an endeavour to provide quality education. Society is dedicated to the pursuit of academic excellence within a caring, personalized setting from the foundation through to all these years.